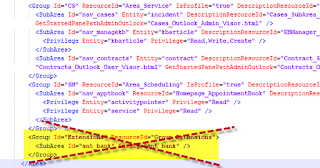 This post is a continuation of the Simplifying Navigation theme in Dynamics CRM. The most recent post regarding this topic discussed making Site Map changes to optimize the CRM Areas or "wunderbar" experience. This post is an extension of that topic i.e. making changes to the menu items in each of these areas. When creating a custom entity, CRM by default adds the entity into a new group called "Extensions" as illustrated below. Or perhaps in one of the other groupings or even in a more aptly named custom grouping. Assuming this is the case, this default configuration makes the user have to "hunt" when navigating between the different areas. So although this is nothing more than a minor tweak it is an important one that should not be overlooked. Kind of similar to updating the widget icon that custom entities have by default to a more relevant uniquely tailored icon (as also illustrated above) i.e. the application will work fine without these small tweaks but that a conscientious solution integrator should be sure to take the time to tweak. This is the proverbial crossing of the i's and dotting of the t's - if these type tweaks are not made then it likely reflects other more fundamental design shortcuts that are being implemented elsewhere in the application due to the general lack of attention to detail. This is something akin to this post in the Harvard Business Review about grammar - the principle of which I generally subscribe to (ok - who is going to be the first person to point out the mistakes in grammar that I have made? Principle or principal? :). This change can be implemented quite simply by exporting the Site Map and removing the SubArea from the Extensions group (the Extensions group can be removed as well). Subsequently copy the SubArea into the Group in which you want it to appear. The order of its appearance will match the order in which it is inserted into the Site Map. Import and publish and you should be all set.